A quick dinner the whole family will enjoy. A quick dinner the whole family will enjoy. 1. Brown beef in a sauté pan. 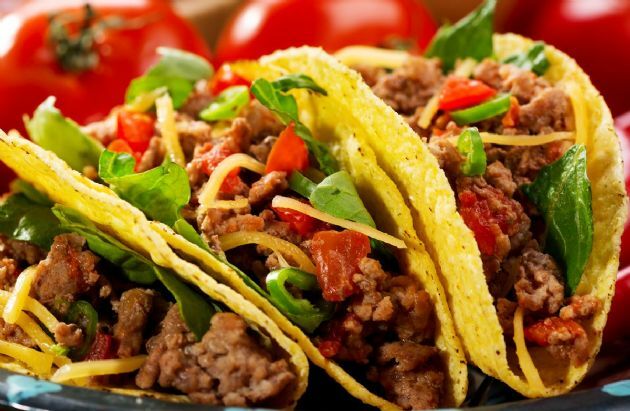 Add water and taco seasoning to meat and bring to a boil. Simmer and stir until desired consistency is reached. 2. Heat taco shells (or tortillas) according to directions on package. 3. Dice tomatoes, shred cheese, and shred lettuce, all to desired amounts. 4. Pour two oz. beef into shell, and top with desired topping.